Anyone Lose An Albino Ferret? 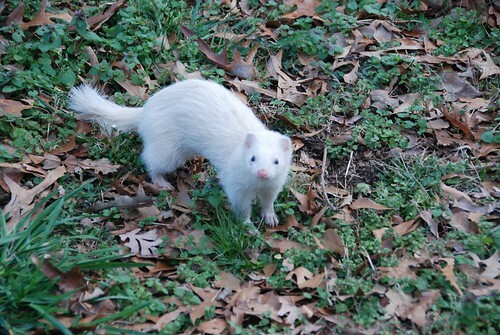 Posted byDave Coustan	 February 24, 2008 February 26, 2008 11 Comments on Anyone Lose An Albino Ferret? Aww. My neighbor across the way helped me identify it as an albino ferret. As I’m pretty sure they’re not indigenous to my area, I’m pretty sure it’s a lost pet. We’re getting the word out and already have a lead or two on who the owner might be. 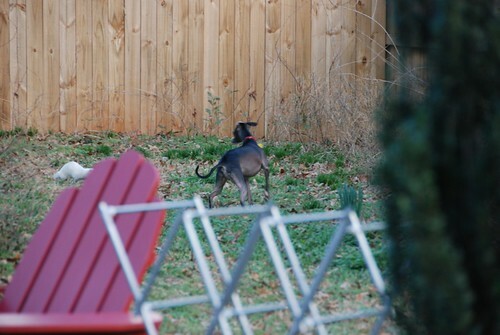 And in the meantime, another of my neighborhood friends has volunteered to foster it. I have really great neighbors. Here’s the full Flickr set from the afternoon. Anyone have a good idea for an interim name for the little fuzzball? Update: I’m very pleased to report that we’ve lined up both a foster home and a potential permanent home for little Afton/Spiderwoman/Whitey/Mrs. White, assuming no one comes forward to claim her as theirs. Since the initial discovery we also discovered this Craigslist listing from February 3 reporting what has to be the same ferret found. I have a feeling the original owner no longer wants it. Afton! And Spiderman seems fitting too. Also submitted elsewhere: Algernon, Mr. White, and Whitey. I lost my female albino ferret, Sami and I am devastated….I sure wish you lived in Texas!….It’s been a while but I will never ever give up or stop looking…I believe she was taken..A large reward for her return or any information will be GREATLY appreciated! anyone has a suggestion on how I might advertise my loss so everyone in Fort Worth is aware of my loss !! Something that will get alot of attention .like a commercial on tv or radio? front page of our newspaper…blimp? Hi i have two ferrets and they are just adorable. A good name for an albino ferret could be Lou-Lou like my albino ferret. Ferrets are wonderful creatures. My friend wished for a ferret for Christmas and guess what… a week after Christmas a ferret walked in her back door, she got to keep her. Anyway when giving a ferret away you might want to make sure that the people can handle it right. They might want to know that you have to clean the cage everyday or else it will stink and that ferrets need a lot of attention. So just make sure the people you give the ferret to are capable of taking care of them. Bye. did somebody claimed the albino ferret yet? but i hope for the best! !